Blue lace agate is one the prettiest stones we have seen With its delicate bands and patterns that look like waves and arrangements that look like lace.It’s among the rarest and most popular agate stones because of its appearance and the many healing benefits it gives to its owner. Blue lace agate is commonly found in Namibia, as well as other parts of the world like the USA, Brazil, India, and China. 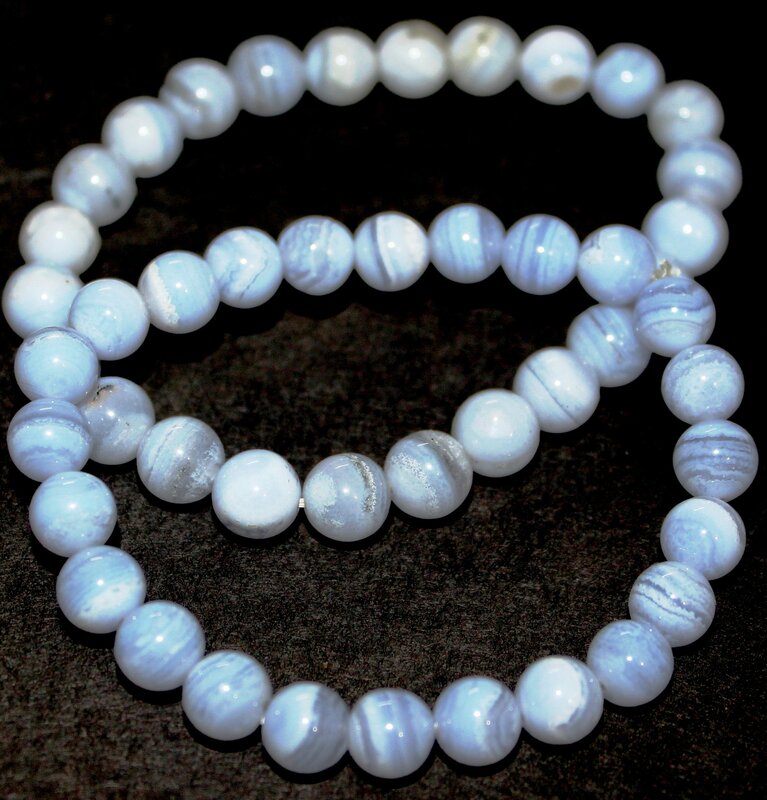 Its name relates to the beautiful lacy bands of grey, white, and blue lines that run through the light blue stone.Blue Lace Agate has a soft, soothing elegance; like sky-blue waters released from winter's grasp. Its graceful, circular design has a stimulating, positive effect on emotions and attitude. It is not a stone of protection, but rather of encouragement and support. Its circular flowing energy calms, uplifts and elevates. Blue Lace Agate is a stone of communication, helping those who have difficulty being heard by others, or who need confidence and articulation to share their truths. It provides clarity of thought and unwavering intent in regards to what matters most. [Simmons, 6] Blue Lace Agate is a Stone of the Diplomat, assisting communication in situations were angry words must be avoided, but clear understanding is necessary. Historically, Agate has been discovered with the artifacts of Neolithic people, and was used as healing amulets and ornamentation dating back to Babylon. Its medicinal uses continued through the ancient Greek and Egyptian civilizations, and spread throughout Africa and the Middle East into Russia. This is a stone that not only looks beautiful but also holds a subtle but powerful energy. It’s a stunning gemstone that can bring you to a higher state of consciousness. This stone can be associated with positive thoughts. You will feel lighter, more hopeful, and more optimistic.You will have a more cheerful outlook, and you will have a more cheerful attitude even when the situation is hard.It’s also a protection stone that will keep you safe from harm in a physical, emotional, mental, and spiritual level. It will cleanse your aura from all negative energies and replace them with only good and positive ones.This stone will ensure that there’s a smooth energy flow in your life. Wearing blue lace agate as a pendant or a necklace or a braclet can help heal your neck and throat problems and other respiratory conditions that you are suffering from.Blue Lace Agate is thought to relieve sore throats, aching or swollen glands in the neck, and may aid thyroid problems.It helps strengthen the skeletal structure, and is useful in treating arthritis and hereditary bone deformity, as well as the mending of breaks and fractures. This stone can also help heal sore eyes and red, irritated skin. It can lower high blood pressure and promote good sleep, just to name a few. Blue Lace Agate also aids in fluid balance around the brain. The hydrocephalic may find relief by using a liquid elixir of this stone. Placed on the abdomen or used as an elixir, Agate stimulates the digestive system and relieves gastritis. It is beneficial for the eyes, hollow organs such as the stomach, uterus, intestines, etc., and heals skin disorders and itching due to insect bites. Blue Lace Agate is soothing for tension-related headaches and high blood pressure. A cold Agate placed on the forehead is generally effective in curing fever. Agate may also reduce the symptoms of epilepsy, and for some people guards against sleepwalking.